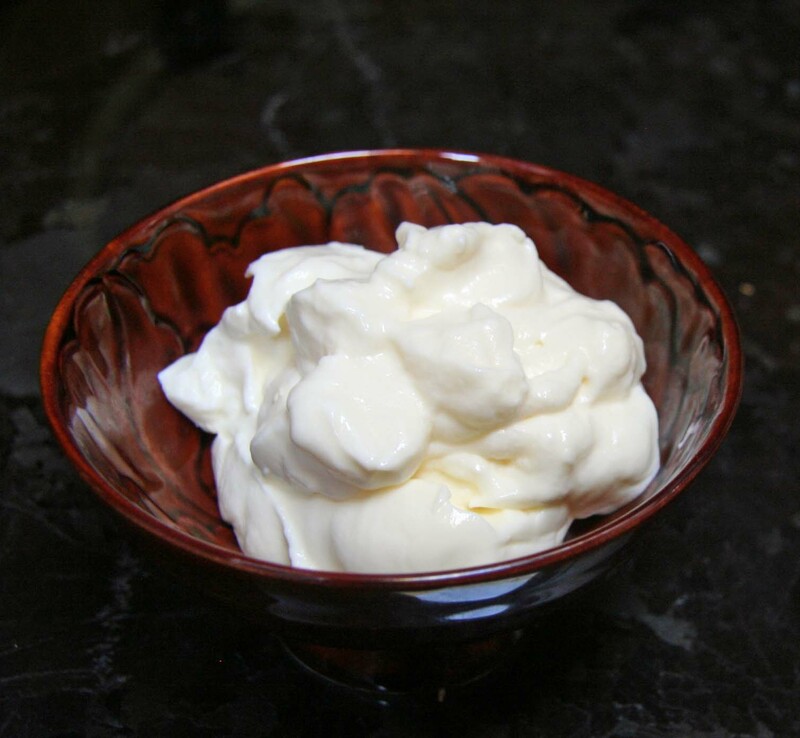 In Greece, Turkey, Lebanon and other parts of the Middle East and Mediterranean, yogurt commonly comes in two forms – regular and strained. What stores in the US sell, labeled as “Greek Style” yogurt, despite saying “authentic” and “natural” on the packaging, are very poor imitations of real strained yogurt. I’m going to show you how to make real yogurt, which is not only a lot cheaper, but tastier and healthier than anything you can buy in the store. Plus, it’s really easy to make! MILK: If you have access to a farm that will sell you *real* unadulterated milk, straight from pasture-raised cows (ideally Jersey cows), even if it requires a long journey to the farm, make the journey and invest the extra dollars – it’s more than worth it! Plus, yogurt will last several weeks. If not, then go to a natural foods store and buy the best-quality whole milk they offer. It may come in a glass jar and it will probably be pasteurized but not be homogenized, so the cream will float to the top. If neither of these are options, plain old “Vitamin D” whole milk will also work. CULTURE: What gives yogurt its distinct flavor is the special combination of bacteria, or “yogurt culture,” that ferments the lactose in the milk and produces lactic acid. You could use many different types of bacteria, including the bacteria that’s floating in the air around you, and they all will produce different tasting yogurts. For example, many people prefer Bulgarian or Scandinavian cultures. Luckily you don’t have to travel to these countries to make their yogurt. You can buy these cultures and many others in freeze-dried form at places like: Homesteaders Supply, New England Cheesemaking Supply or Dairy Connection. What I used in my recipe is “ABY 611” from Dairy Connection. If you want to make yogurt today and don’t want to wait to get your culture in the mail, then just go to the store and buy something like Brown Cow or Seven Stars plain yogurt and use a couple of tablespoons of that in place of the freeze-dried culture. Glass jars, a thermometer, a pot and a cooler or other insulated container. Heat the milk in a pot on the stove and stir occasionally to prevent a skin forming on top. The milk should get to about 185 degrees Fahrenheit, which is almost boiling. If you let it get hotter, then it will over-boil and you’ll have a big mess. If this happens, you can still use whatever’s still in the pot. You may be wondering why I’m recommending pasteurizing the milk if I’m such a fan of raw milk. You don’t have to. But if you don’t, then the flavor of that fancy culture you’re using will be diluted by the stronger flavor of other, local cultures hanging around in the milk. NOT that I believe in discriminating against the locals! 😉 Your end product will still be yogurt and will be quite nutritious, but it will probably taste a lot more sour than you’re expecting. Let the milk cool to ~105-110 degrees. If you’re in a hurry, set the pot into an ice-water bath and stir. Add a pinch of freeze-dried culture (or a few tablespoons of another batch of yogurt) to the jars, followed by the warm milk. Close the jars and place them into the cooler. Add hot tap water to the cooler. Just make sure your tap water is not more than ~115 degrees or you’ll kill the culture and will end up with warm milk and not yogurt. Cover and let it sit for 24 hours. You may want to change the water once, since it will cool. After 24 hours, your yogurt should be set. Dry the jars off and refrigerate. At this point, you’re done making regular yogurt, which should already have a nice, firm texture and a layer of cream on top. If you want to make strained yogurt, then just scoop some of the chilled yogurt into a fine mesh strainer (or a strainer with bigger holes, but lined with a towel) and set it over a bowl. Or, you can buy a dedicated yogurt strainer like the one I have pictured. Let the whey drip out for a few hours until you end up with the consistency you want. Or you can leave it for 24 hours or so and you’ll end up with cream cheese. If you want to make cream cheese, stir in some salt before straining it. Trust me, it’s better than Philly style! How to use the yogurt? Yogurt mixed with grated apple and a berry, honey, and topped with nuts is my standard breakfast. 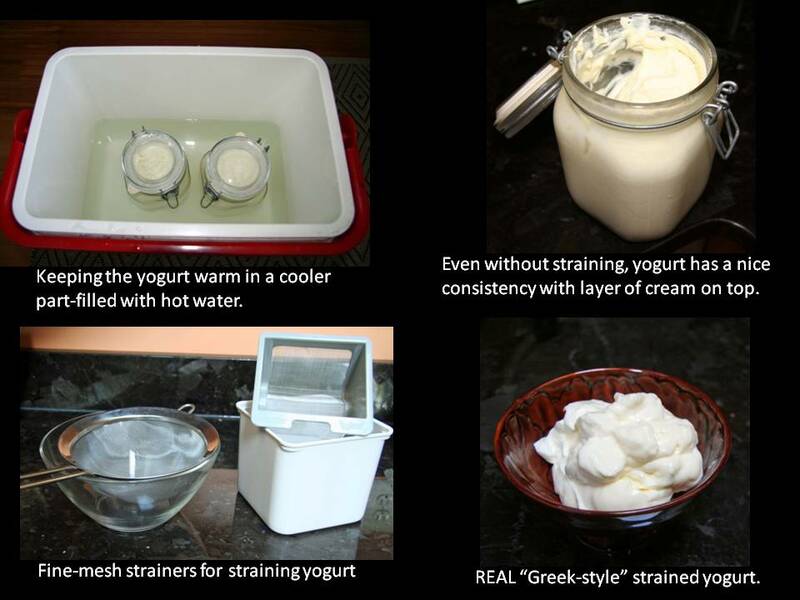 You can do this with regular or strained yogurt, although I find strained yogurt a bit heavy for breakfast. Strained yogurt makes a great condiment, mixed with salt and perhaps smashed garlic, served the same way you might serve sour cream – with chili, topping a baked potato, alongside zucchini pancakes or meat-stuffed vegetables. I sometimes add a bit to salad dressings. Or make tzatziki by mixing the yogurt with salt, grated cucumber and some raw smashed garlic. After straining the yogurt, don’t throw away the whey. There are lots of things you can use it for. 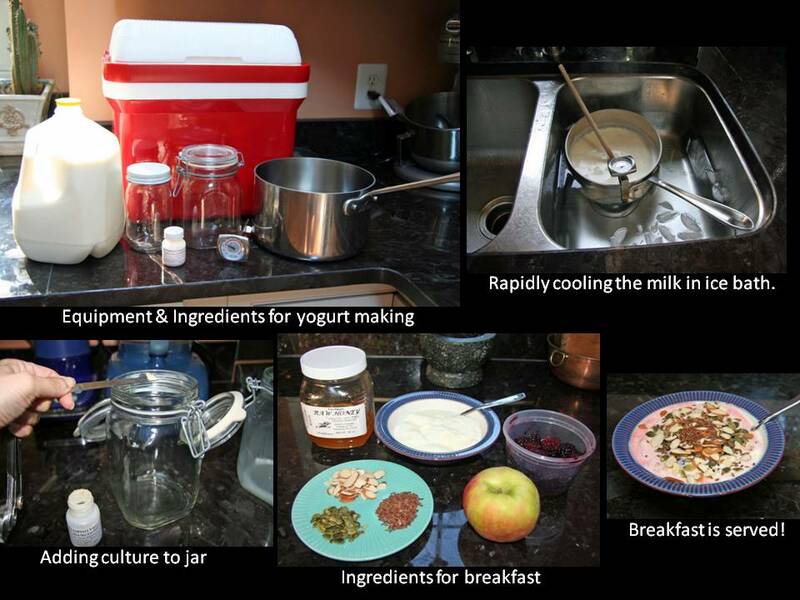 I already make my own yogurt (I use small yogurt maker made by Donvier), but have had the pleasure of watching and learning from Nevra just how easy and simple it is to make without a machine. With nothing but the stove, a starter, a few jars and a cooler, you can have yourself an incredibly delicious and very satisfying snack. I don’t remember the last time I went a day without yogurt! Mmmmmmm yogurt! Love it, eat it EVERY day! I hate to say but I don’t make my own, will try though. Take 1L (or 1QT) or raw milk or whole milk. Boil it. Turn the stove off. Squeeze a lemon in it. Wait…once curdled, pour it in a kitchen cloth or a T-shirt or what have you in cotton! Place in a bowl in the fridge, wait (until it is kind of strained)…and EAT sprinkled with salt, fresh herbs, or honey. Christel, thanks for this. I’ve made Ricotta this way before and you’re right, it’s delicious! I make mine in a small round crockpot. 1/2 gallon raw grassfed milk, 1 hr on high, 2 1/2 hrs on low, 3 hrs off, cooling back down, mix 1/4 cup of yogurt into cup of milk then mix into the rest of the milk, Wrap crockpot in towels and leave on counter for a day, put in jars and into fridge. We love it! However, I LOVE your jars that you make your yogurt in… might have to try the hot water in the cooler!